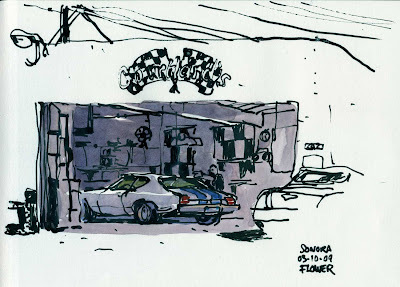 Stéphane Kardos: Behind "Jimmy's Super Lunch"
The guy you see polishing the car asked me nicely if I had a problem, I was staring at the car you see, that's what you do when you draw something, you look at it, he didn't like that. He relaxed a bit after he saw the sketch, he didn't want to make me eat my sketchbook anymore. We are best buddies now. The end. Ah... It looks Hannah Barbera´s Garage. This is cool! I like the purple tones! - Hey thanks Neysa, saw you at the commissary today. Jestes szalony Stephane. Tez cie kocham. Also, I really love those night sketches! Beautiful! I bet his girl was in the car at the time. You French guys!! - Paulette! what are you doing up at this time of the night?! - Merci Stacey :) see you tomorrow! - you got me Mike, this is what I wanted to do actually, draw the girl, but I had to pretend that I was interested by the car. You're lucky you didn't get your arse detailed. I would have beaten you up and eaten the sketch book myself. Elliott and Vince, I love you. I love seeing all your sketches of the area where we work! I've been working around this area off and on for the last six years and all these spots are so engrained in my head. I've had many a meal at Jimmy's Super Lunch. That place is very under rated. That mechanic's shop is has intrigued me for so long so it's to find out from you what they're all about. Great work as always my friend.